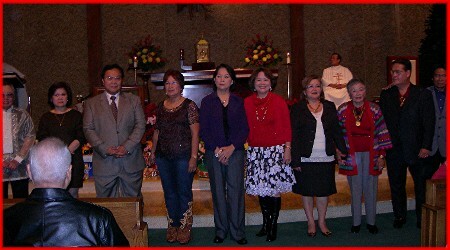 Visayans from all over Southern California came together on Saturday, January 12, 2008 to celebrate the Feast of the Santo Nino at the Saint Cornelius Church in Long Beach, CA. 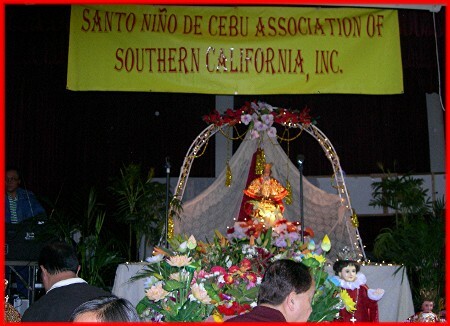 The event was sponsored by the Santo Nino de Cebu Association of Southern California, Inc. The church was filled to the rafters with devotees saying novenas, prayers and petitions to the most Holy Child. The solemn mass was concelebrated by Monsignor Manalili and Reverend Father Ben Alforque. 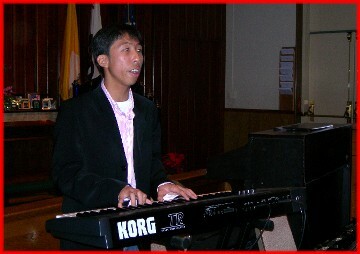 The melodious strains of the Devoted Children of Mary Channel Parish choir, led by Richie Mercado, punctuated the otherwise austere proceedings. Fr. Alforque's homily touched on the true meaning of the Sinulog which is "to celebrate this faith, panaad, hope and love to the Living God together." After mass came the procession of the various Santo Nino images, accompanied by the synchronized beating of the drums and whistles synonymous with the Sinulog Festival. The procession ended at the social hall where the predominant Sto. Nino was laid on the stage and festooned with flowers. Throughout all this, the devotees danced and waved their hands, adhering to the festival's traditional motions. The Association officers gave their speeches to welcome the big crowd and to share the bounty with the rapt throng. Monsignor Manalili said the blessing over the great abundance of food which included 14 "inasal na baboy" (crackling pig) and many, many other hearty and filling native Filipino dishes. The President, Oscar Ramirez, gave his opening remarks which was immediately followed by the special presentations of various Sinulog tribal dances. Immediately following the performances, the attendees and worshipers came together as a whole to engage in the classic Sinulog dance. 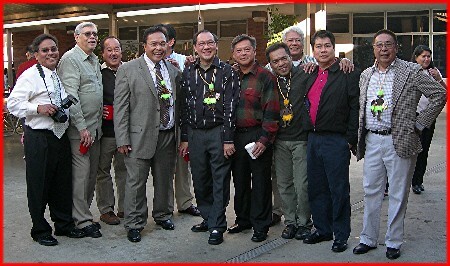 Nick Diotay , the immediate past President, assisted by Becky Diotay officiated in the raffle drawing, proceeds of which were intended to help finance the many projects of the association which include the yearly Sinulog in Long Beach and proposed Medical Missions to Cebu, Philippines. Happy Fiesta everyone!!! Join them again next year and immerse yourselves in the rich Visayan heritage and tradition that is the Sinulog. 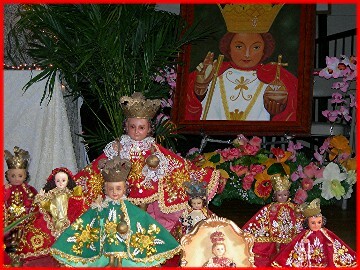 Exalt in our faith in the Santo Nino and share in the many blessings to be garnered from this multifaceted legacy. 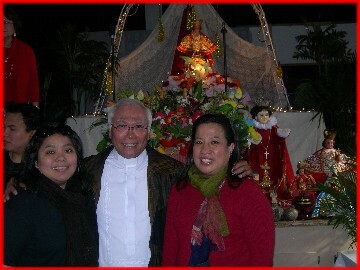 Richie Mercado, "Bato Balani sa Gugma"
*Meet the Santo Nino de Cebu Association of Southern California, Inc.